Like Wi-Fi, wireless video holds the promise of freeing our laptops and mobile devices from cumbersome cables. This is more than a simple convenience in many situations. Imagine a standard, technology-enhanced college classroom. While there is some variation from institution to institution, one element you’ll most commonly see is a lectern packed full of computers and AV components: DVD player, switcher, control panel, even the occasional aging VHS player. The lectern is also likely the only physical conduit to the room’s projector(s). There are a bevy of products & strategies for wireless video. Which approach will meet your facility’s budget & needs? As a professor teaching in this type of space, the lectern is home base, the amalgam of technologies that amplifies one’s voice and channels are all necessary visuals. Similarly, imagine a typical office conference room or group study space, with its large rectangular table, projector, and video cables sprouting from the center. In each case, there is a preferred station for the presenter located at the locus of said technology (the lectern or wherever the cables reach) that suggests a dynamic where an individual is presenting to an audience. When there is a need to change presenters, the awkward shuffling of wires and devices can be disruptive. Now imagine a classroom or meeting room with all the same capabilities, but with no fixed focal point. The dynamics are closer to an organic conversation, our focus shifting naturally to whoever wishes to speak, and that speaker able to share pertinent resources from where they are with a gesture. This “conversational dynamic” is the most aspirational aspect of modern active learning classrooms and highly productive workspaces. Wireless video—or more specifically, the hardware and software that enables devices such as laptops and tablets to share their display wirelessly to a television or projector—has been possible for many years. However, it is becoming more widely used in classrooms and office spaces due to new standards and improvements in network bandwidth and security. From a technical perspective, it’s important to understand that almost all wireless video solutions use Wi-Fi to transmit the video signal. Some utilize Wi-F Direct to connect peer-to-peer and bypass the local wireless access point. Next, your device needs to discover nearby wireless displays. Discovery is often achieved through Bluetooth or near-field communication (NFC), but can also be accomplished via Wi-Fibased broadcasting such as Apple’s Bonjour protocols. Each of these approaches come with limitations, and may be regarded as undesirable to some network administrators. For example, Bonjour is often blocked on enterprise networks. Regardless, most discovery methods aim to achieve minimal or “zero configuration,” so setup for the user is quick. 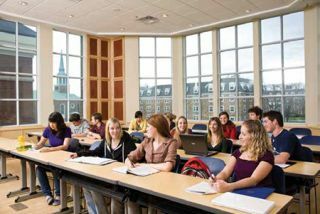 An example of technology used in a college classroom. How many of your AV & control devices can be operated wirelessly? What products can help you go wireless? The wireless video market includes a few standout products, each with their unique strengths and limitations. Apple’s Airplay protocol and AppleTV product allow laptops and mobile devices to very easily mirror their displays, but require MacOSX or iOS. Google’s Chromecast dongle is small, inexpensive, easy to use, but currently only allows video from supported apps such as Netflix (true mirroring is a beta feature). Miracast is a standard based on Wi-Fi Direct and is used in a variety of products, including most running Android 4.2+, but suffers from latency (the lag between the video signal being sent and displayed) and other issues. The Kickstarter-funded AIRTAME (https://airtame.com) is a newcomer generating plenty of buzz. It promises to combine the best features of the aforementioned devices (zero-configuration, 1080p video, multi-platform support), but this remains to be seen. For now, you’ll have to assess your needs before investing in a particular product, but you have some quality options from which to choose. Whatever approach you take, wireless video takes us one step closer to a completely untethered technology experience and transforms our ability to collaborate in a variety of spaces. Chris Millet, M.Ed., is assistant director, Education Technology Services at The Pennsylvania State University. This story reflects the opinions of Chris Millet and does not represent the official position of The Pennsylvania State University.